Share "Winter Horse Care Checklist"
Horses are resilient and can survive many adverse conditions, but taking proper care of your horse in winter is essential to keep them healthy, safe and comfortable even in the worst weather. Fortunately, even small steps for proper winter horse care can help both you and your horse avoid the biggest seasonal problems. Food: Proper nutrition will help keep your horse healthy, and it is essential to provide them with additional forage and hay in winter, not only to maintain a proper weight but to generate sufficient body heat on frigid nights. Grain can be added to their diet as well, but consider your horse's specific nutritional requirements before making drastic dietary changes. If you have multiple horses, be sure each one has adequate access to feeding areas, and monitor their weight regularly and adjust feeding schedules if necessary. Water: All horses need fresh, clean, liquid water to drink in winter. Warmer water is better and encourages more drinking, as well as requiring less energy to heat up and digest once it is drunk. Check water tanks to be sure heaters are functioning properly, and make any repairs immediately to avoid problems with short circuits or ice buildups. Shelter: Horses grow heavy winter coats, but appropriate shelter can keep them more comfortable, particularly in stormy conditions. Barns should be draft-free but still have suitable ventilation in winter to prevent respiratory problems, and corrals should have a sheltered area where horses can stand out of the wind or snow. Check shelters regularly for sharp corners, icy patches and other hazards that could endanger your horse. Exercise: It can be tempting to give your horse a winter vacation, when shorter days and colder temperatures make riding less enjoyable. Horses still need some work to maintain muscle tone and joint flexibility, however, and you should provide adequate exercise to keep them in good shape for spring. Turnout time can be part of and exercise schedule, but should not be the only workouts your horse gets in winter. Shoes: Check your horse's hoof health in autumn, and consult with your farrier about their best option for winter. Some horses do best without shoes in winter, while others may need winter shoes that provide better stability and traction on icy surfaces. Always check frequently used surfaces for trip hazards and other obstacles, keeping them clear for easy walking and standing. 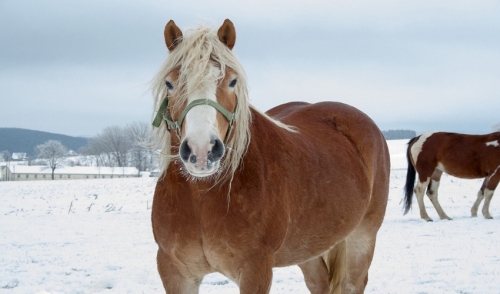 Coat: A horse's winter coat can protect it from many winter weather conditions, but if a horse is in poor health or has been clipped, its natural coat may not be adequate. Use blankets if necessary, but ensure the horse is warm and dry under the blanket and clean blankets regularly to keep them suitable for winter use. Note any bare patches or other coat problems that could indicate more severe health conditions. Health: A full veterinarian checkup in fall can help pinpoint any concerns that should be addressed before winter, and all horse owners should be aware of the warning signs of poor winter health, including weight loss, coat condition, hoof health, frostbite and hypothermia. If any health decline is noticed, prompt veterinary care is essential. A healthy, comfortable, well cared for horse can weather winter conditions admirably, and will be happy and ready for spring.